When I first saw images of the HyperRev 2015, months before its release, the first thing that came to mind was “Jet Flight”. The cult classic shoe of the Dirk/Nash-era Dallas Mavericks featured a unique mesh bootie build with second upper layer that laced up around it. Atop a Zoom forefoot/heel Air Max midsole, the shoe was one of the best performers of the early-00s and is probably my all-time favorite performance design. 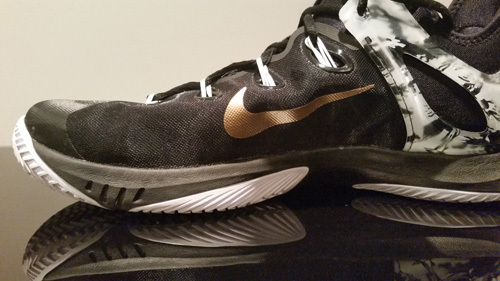 The HyperRev 2015 isn’t exactly the same thing, but seems as if it carries on some of the lineage of the Jet Flight: Zoom forefoot cushioning, a full inner bootie base with a Fuse/Flywire outer shell, and wraparound heel counter integrated into the eyelets. Like its distant relative, it’s a premier performance option on court as well. 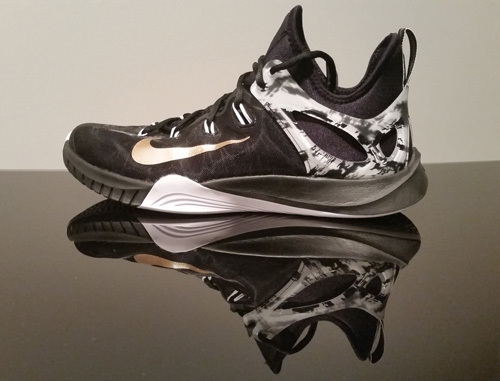 One of my biggest complaints about last year’s HyperRev 2014 was the poor fit all over the shoe. With just five eyelets that barely laced to the top of the foot, a few measly Flywire cables and no heel counter, I could not get any kind of lockdown or security despite the layered mesh build. The 2015 version jut about remedied all of that. I did go down a half-size to an 11 for this shoe – for those wondering about sizing info – although I can do this easier with a narrower foot. The neoprene bootie by itself provides a better fit than last year’s version – and is snug enough that it’s tough to get on at times. A Fuse shell wraps around much of the upper, providing more security and lockdown than the 2014 model. 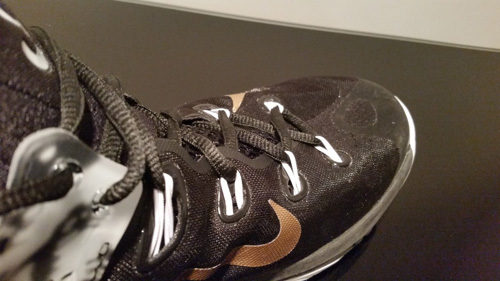 In fact, the forefoot fit was really pretty solid with minimal slippage compared to any shoe out there. It’s not going to give you full lockdown – you lace through and rely quite a bit on 4 sets of Flywire cables – but it’s pretty good and the fact that the inner bootie holds your foot so secure to begin with that it makes it feel glued to you. Speaking of that lacing system, you do lace through Flywire cables but also directly through eyelets of the Fuse shell. I’d like to experiment lacing through the eyelets only and forgetting about the Flywire to see if that gets rid of the inconsistent fit and feel of the Flywire. The molded TPU heel counter makes the heel fit absolutely miles ahead of the 2014 version. The cage wraps around the heel and has two eyelets at the end to tie it into the lacing system. It’s positioned pretty perfectly around the ankle bone and really locks the heel in. There are also two molded Achilles notches on the interior of the bootie – a tremendously overlooked aspect to providing good heel fit. The whole thing really fits like a sock and moves just like an extension of the foot. Transition is super smooth – on par with the best out there. There’s no internal or external midsole shank so support may be an issue for you but it’s a flexible, fairly responsive setup that lets you move naturally. 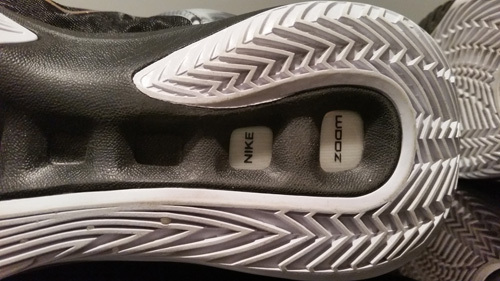 One fantastic aspect of the original HyperRev was the full length Zoom unit – something we don’t see too often anymore. Housed in a soft Phylon midsole, it was a pillowy, responsive cushioning setup that most people – including myself – loved. It had very little structure though, and I found my arches quickly getting sore from the lack of support. 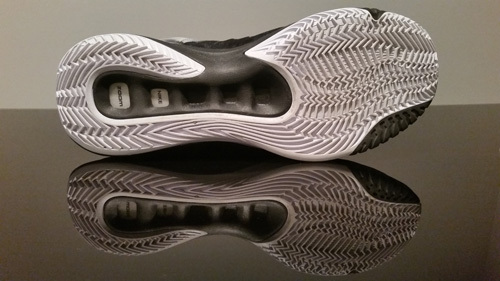 The 2015 switches to a firmer midsole foam and independent forefoot and heel Zoom units. Responsiveness is very good, probably a step down from last year, but still nice and bouncy. The flexible midsole and sock-like fit allow the shoe to move with you no matter what. 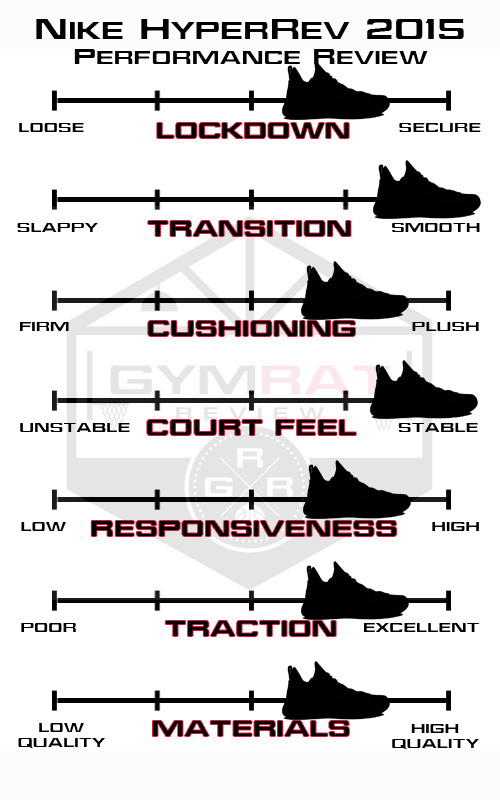 Court feel is also awesome thanks to the low profile cushioning and great flexibility, and overall the cushioning is fairly plush compared to most on the market. It’s firmed up some and feels thinner than last year so don’t expect it to feel exactly the same, but you get better structure and support from the 2015 cushioning setup overall. I thought the traction on the 2014 model was pretty terrible, and I’m happy to report the 2015 is much better. Deeper, wavy herringbone grooves and a seemingly tougher rubber compound gives you better grip on most floor conditions. With the neoprene bootie, Fuse shell and TPU counter there are plenty of independent pieces to the HyperRev 2015 but I expect them to hold up pretty well. They didn’t seem to accumulate a bunch of wear even playing in 3 to 4 leagues per week, and I haven’t seen any issues crop up so far. I’ve only used them indoors, FYI, and I’d probably hesitate to take them outside. 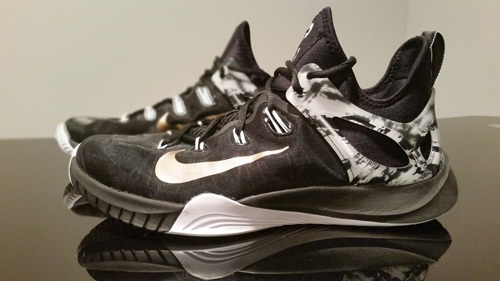 I really loved playing in the HyperRev 2015, and it’s been one my favorite recent pickups. It’s a little thin on forefoot cushioning but that’s probably my only real gripe – I think as I get older my old bones value impact protection more and more so that’s probably part of it. It fits like a glove and the flexibility and responsiveness make you forget the shoe is even on. I personally love the inner bootie construction and the natural feel; as a point guard, is something you always value. The vastly improved lockdown simply makes the HyperRev an awesome guard option and one of the better performers out there right now. Thanks for the review JT. Good Stuff as usual. I have these shoes as well in the Orange and Blue CW. I love the way they look and more importantly love the way they play. If I had to choose one gripe about them it would be that I wish the forefoot cushion was a little more responsive. Besides that I love everything about them though. 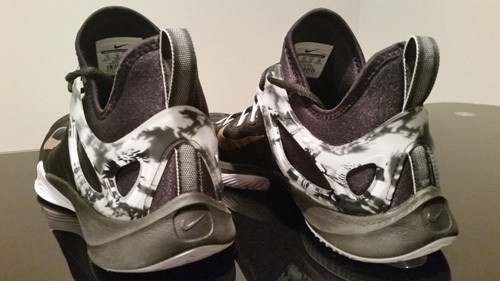 The lockdown is probably the best I ever had personally for a lower cut shoe. They are always in my bag. Great to see you’re back ! I agree 100% with your review. Light years ahead of last years ! Thanks man. Will continue to post as funds allow! Nice review! You said it was one of your favorite pickups……. May i ask what is/was your favorite shoes to play in? I’ve had a few different ones, but my favorite had to be the Kobe VI. Only shoe I’ve ever bought multiple pairs of. But the Zoom BB2, TS Supernatural Creator, Crazyquick 1, and Curry One are up there too. Good read. Live the reference to the Jet Flight. If Nike does me one favor the rest of my life, I ask for them to retro that specific shoe. The basic construction is similar and it really was the first shoe that came to mind. I would be content to never buy another pair of shoes if I could get my hands on some jet flights one way or another. I think its tech would hold up well by today’s standards and still be one of the best performers. Thanks again for the excellent reviews. Even though this is a year old I had a question. 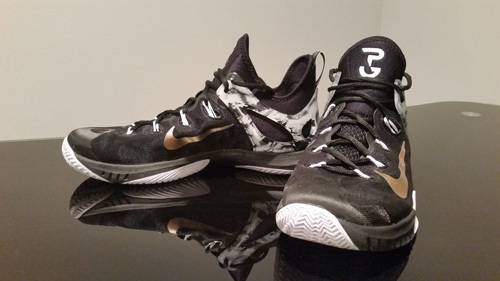 Do these feel like a low top (Kobe 8, 9, 10) or more like the mid top feel (CP3 7,8, 9)? Hard to tell from just the pics with the construction of the shoe. Thanks man! Thanks man. I think I’d answer your question two ways: it laces up like a low but the bootie gives it the feel of a mid against your ankle. Then again, it’s basically a sleeve so there’s not the extra bulk of a mid. It honestly feels close to a Kobe than the CP3 line. CP3s shoes are always pretty sturdy with Fuse or some kind of tough, synthetic upper. There’s “more shoe” if you know what I mean. Kobes are more stripped down with a one-to-one type fit thanks to engineered mesh or Flyknit. These don’t lace up any higher than a low top, and the sleeve doesn’t act like mid-top upper. Great shoe.